UPDATE: Congrats to Cory Mack for winning the 2 tickets. 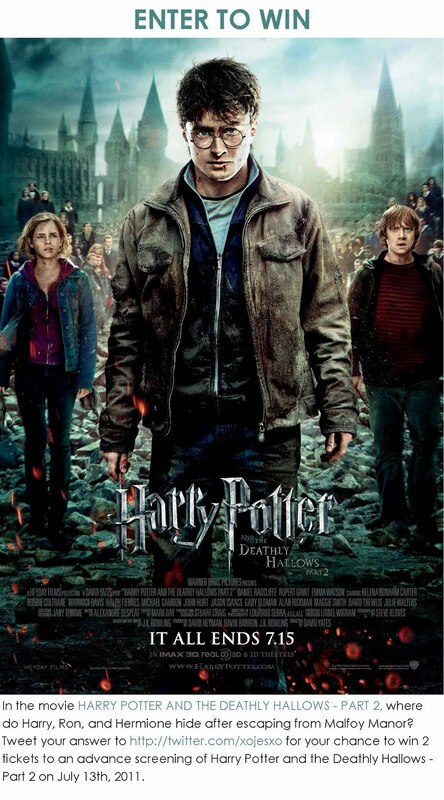 Harry and the gang are finished after the final installment of the Potter franchise is released next week. There are a couple of chances for you to win tickets to the advance screening on July 13th. Your first chance is through this contest. Tweet the correct answer to me at @XOjesXO by Monday July 11 at noon for your chance to win 2 passes. Winner will be announced Monday evening. "In the movie Harry Potter and the Deathly Hallows Part 2, where do Harry, Ron, and Hermione hide after escaping Malfoy Manor?" Your second chance to win is this Saturday July 9th at 9:30PM at Vicious Circle. Any group that contains 20 or more people are guaranteed passes to the film. There is also chances to win passes as well as prizes within the first 2 hours of start time. There is no cover for this event. Must be 18 years or older to attend. SHELL COTTAGE> RONS BROTHERS HOUSE!!! bill and fleur's house .........shell cottage by the sea. this is tammy btw.